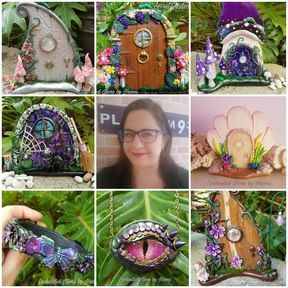 This Welcome Rock Mini Fairy Garden Set is a great way to start your very own Fairy Garden and to bring a little bit of magic into your garden. 1 hand sculpted Welcome rock which has on the side, a red and white mushroom and a little ladybird sitting in top. Approx. Size starts with 3cm tall flat top mushroom, with 2 other mushrooms tappering down in size to approx. 2cm tall. White fence approx. 11cm long x 3cm tall (not handmade). A hand sculpted little ladybird approx. 1.5cm wide. A bag of neutral pebbles enough to make a Fairy path. A sitting little green gem Fairy approx. 5cm tall.